A.) The total of the skill levels of the three players fielded in any team match cannot exceed 13. B.) Maximum of five players allowed on the roster. C.) Teams may choose any three of the five team members to participate in each team match. D.) Byes - 6 points are awarded to a team receiving a bye. E.) Team Forfeits - 6 points are awarded to a team receiving a forfeit. F.) Division winning teams and players are not eligible for the World Championship as a result of their participation in this format. 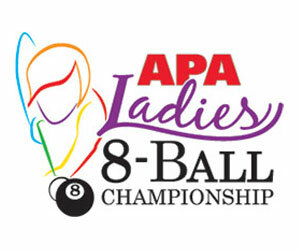 G.) Ladies-winning team gets a spot in Vegas Ladies Championship and receives travel assistance. broken and any subsequent matches. player who did not show up is a SL3, then the other two that played cannot exceed 10. During Session Playoffs and all levels of Tournament play, the 13-Rule is still in force. It is not permissible for a team to lead off with two SL6s with the idea of winning the first two matches and forfeiting the team match if one of them loses. A team must show that if the team match had gone the full three individual matches they could have stayed within the 13-Rule. It is permissible for a team to count someone who is on the roster but not present at the match site. In other words, a team may plan on using a SL2 even if she is not present at the match site. The team would have to forfeit the third match, but the advantage they gain is the right to play a higher skill level player earlier in the match and there is always the chance the player that didn’t show up might have shown up. When forming a new team, team members should exercise caution regarding the number of highly skilled players they recruit. If the team improves to where it can no longer comply with the 13-Rule, then it must play two players whose combined skill levels do not exceed 10, and forfeit the third individual match. No team will be allowed to add a player to the roster for 13-Rule purposes after the fourth week of play without prior approval from the League Office.